Presentation skills, the foundation of your practice. Why Presentation is the essence of leadership. Learn the approach rather than a process. The power of story telling. How to put the story together. Book a free coaching call with Barry F. Polansky DMD. Barry has been one of the true leaders in practice management for many years. You can trust his advice as being beautifully researched and presented in a way that is easily understood. I am a big fan of Barry and know you will be, too, once you become absorbed in his wisdom. The Art of Case Presentation is about a lot more than tips and tricks for succeeding in dentistry. Barry brings together some of the best thinking from the worlds of psychology and philosophy, and shows how to apply it in a clinical setting. This is a thoughtful examination of what it takes to really connect with patients in a meaningful way. I love this book! Dr. Barry Polansky combines time-tested wisdom, great storytelling, and contemporary issues in a way that keeps me engaged. Read it and follow its advice! Like the engaging storyteller that he begs us to mimic, Barry comfortably combines the art, science and business of dentistry into a must-read prose for dentists who want to break free and thrive. He inspires us to work towards a mission-driven, balanced approach to comprehensive, relationship-based care. The fabric of THE Art of Case Presentation is woven with a beautiful blend of contemporary, traditional and personal stories, anecdotes and scientific support. From Sun Tzu to L.D. Pankey through Malcolm Glidewell and Daniel Pink, Polansky references an incredible depth and breadth of voices that support this philosophical approach to dentistry. This book is about far more than THE Art of Case Presentation title implies. It speaks to our core beliefs as people of value who just happen to be dentists. "If you build it they will come." Barry provides the design concepts needed to build the practice you have always dreamed of. You will read and re-read this book for years to come. Wisdom combined with great advice on HOW TO. You have helped young dentists realize they must be themselves, be thorough, be truthful and sincere. Everyone needs to not only read this book, but also reread it until they own the information. Barry Polansky is one of the finest educators I know In dentistry today! His writing is heartfelt, positive, motivational, and inspirational. Our profession is richer thanks to his words of wisdom. Barry has created a wonderful book. It is such a pleasure to be inspired and challenged to look at dentistry with true passion and in such a way that every dentist can find a path of clinical practice that fits her or his personality. THE Art of Case Presentation helps us become a better leader and find our path to true professionalism. Dr Barry Polansky has done it again. He's harnessed his enormous breadth of knowledge of dentistry, history, and human nature into a must-read for anyone aspiring to the pinnacle of our profession. Barry is one of the best-read people you will ever meet; his book, THE Art of Case Presentation, is a reflection of the wisdom he has acquired over decades of applying his clinical and verbal skills. THE Art of Case Presentation is a timeless reference book for young and experienced dentists. Anyone can open it, turn to any one of its pages, and have an eye-opening moment. It is written in Barry's straightforward and unpretentious style. It reflects the intensity, passion, and overpowering desire to help others attain the professional greatness and personal satisfaction that dentistry holds for us. The very qualities which we love about Barry jump out at the reader. Like a bottle of good wine or single malt scotch, take your time with it, go over it again and again, and savor its complex simplicity. Put simply, buy it, read it, and love it! THE Art of Case Presentation is a must read for today's young Dentists. In a day and age of "how fast and cheaply can anything be done," Dr. Polasky has written a book that brings us back to the basics of communication and quality in dentistry. After 27 years, I still practice both of these skills with great personal and economical success. It is the patient relationships that brings so much joy to our occupation. Many dentists protest, "They never taught us business in dental school." The real question for all dentists is: “So, what are gonna do about that NOW?” Your book is the BEST starting point for a dentist serious about success in personalized dental care. Simply read THE Art of Case Presentation, highlight the books mentioned, read one book a month, and in a year you'll be on your way to a Masters Degree in Success! THE Art of Case Presentation is an engrossing book full of humor that hits the target when it comes to understanding what today’s experts have to say about engendering trust and persuasion. The two most treasured books on my bookshelf are: A Philosophy of the Practice of Dentistry by Dr. L. D. Pankey and Evaluation, Diagnosis, and Treatment of Occlusal Problems by Dr. Peter Dawson. Now Dr. Barry Polansky’s Art of Case Presentation will take its place beside them. 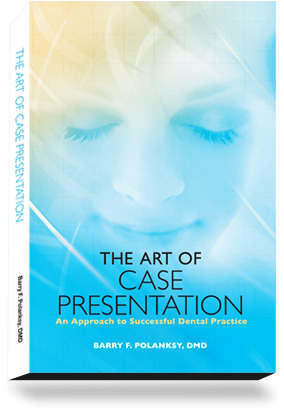 The Art of Case Presentation is yet another treasure given to Dentistry by Dr. Polansky, truly one of the great philosophers of our time and his book reflects the multitude of his experiences in dentistry and life. Along with learning a philosophy of comprehensive dentistry, the reader will gain definitive tools and strategies necessary to become a more effective communicator. Case acceptance starts with a great relationship with our patient but there are so many other skills most of us are either not trained in or are not even aware of. Thanks to The Art of Case Presentation, the reader will become a student of effective case presentation and acceptance. This book is ideal for any dentist who has been confused and disappointed by patients' unwillingness to proceed with care. You could read a library of the best books on inspiration and motivation, or you can read this one, which applies the wisdom of all of them into conversations in a dental practice. Through his own use of storytelling, combined with clear action steps, Barry Polansky takes the mystery out of helping patients accept treatment. I enjoy having time to digest Barry’s logical sequencing of how complex experiences and feelings have been explained in the literature. I feel like I am on a Viking cruise ship down an historic river, with each port disclosing yet another aspect of how we journey toward fulfillment and why. But almost better than having a friend with a boat, is having a friend like Barry, who has consumed every available philosophical and business book known to man. If you want to know the latest great read, ask Dr. Barry Polansky. THE Art of Case Presentation is a remarkable book to share with my son who is early in his journey in the dental field and as I approach my fortieth year in the field. While we feel sometimes like we have seen it all by this stage, there are always insights that are valuable to revisit and share, and yours is the ultimate in guidebooks to great professional development. Dr. Polansky's new book, THE Art of Case Presentation, is truly a transformational and thought provoking experience which I feel needs to be an essential part of any progressive healthcare professional’s library. If you want to thrive emotionally and financially in what is fast becoming a crowded and confused arena for consumers in choosing the "right" provider, then the topics and learning sections in this book are critical to being supported on your journey. Developing strong posItive emotional relationships and trust is the essential piece for future success and happiness, and Dr. Polansky's new book is the needed learning tool to help in your achievement of this goal. Dr. Polansky demonstrates that it is not about having the "latest" technological piece of equipment or software, but it is still about the one-on-one bond of trust and connection which produces the highest level of referrals and treatment acceptance. Get expert help with the skills and leadership issues that you face in your dental practice.